Superb accuracy, mild recoil - perfect for the range! Prvi Partizan has been a top Serbian munitions manufacturer since 1928. All their ammunition passes rigorous inspection processes and is made to the highest standards of quality. Widely known as a police sidearm cartridge, the .38 Special has become popular as a modern self-defense round, as well as a great range round because of its accuracy and mild recoil. 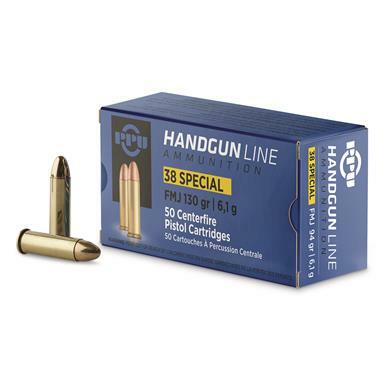 PPU, .38 Special, FMJ, 130 Grain, 50 Rounds is rated 5.0 out of 5 by 1. Rated 5 out of 5 by Big Al from Inexpensive, but reliable practice ammo I've fired about 250 rounds of the PPU .38 spl FMJ through my GP100 with no misfires and reasonable accuracy. It exhibits a normal recoil. Leaves normal amounts of metal and burnt powder residue - no more or less than US-made ammo. It's my preferred practice ammo.